Mrs. Devorah Breina Cohn was born Dweira (or Dwejra) Epelgrad (anglicized: Devorah Applegrad) in Slonim, Poland in 1916. Devorah’s father, Jakob Zundel Epelgrad was a bochein in the Slonimer Yeshiva, but travelled back and forth to America to raise funds for the Yeshiva. Her father had promised her she could go to the Bais Yaakov Teacher’s Seminary, but after his sudden death in New York, funds were scarce and, in addition, her brother was against her going to Bais Yaakov. The family sent her brother to the Slonimer Rebbe to ask him what to do, and as the family story goes, he said, “shikt ihr (send her).” Devorah’s older sister Rochel (future: Rochel Bina, wife of Rabbi Aryeh Bina, founder of Yeshivat Netiv Meir in Jerusalem) ran the family’s store (kreml) that was open on market days. Her mother would bake and make ice cream for their shop and they also sold ready-made food. The family used the money from the shop to pay the relatively expensive monthly tuition. Devorah would frequently tell the story of the one month when her family was late in paying, and she was not allowed to attend classes until the tuition payment came through. But Sarah Schenirer told her that she could still attend her class in the meantime. Mrs. Cohn made the sixteen-hour train trip from Slonim to Warsaw to Krakow in order to attend Bais Yaakov Teacher’s Seminary in 1933. She studied there through the end of December 1934. Upon graduation, her first teaching assignment was in Ruzhan, then she went to Lechovitch, and then finally she taught in her hometown of Slonim. When Slonim was taken over by the Russians, after a short time, they decreed a six day week, which created a conflict with Shabbat observance. At this point, Devorah enacted her plan to flee. 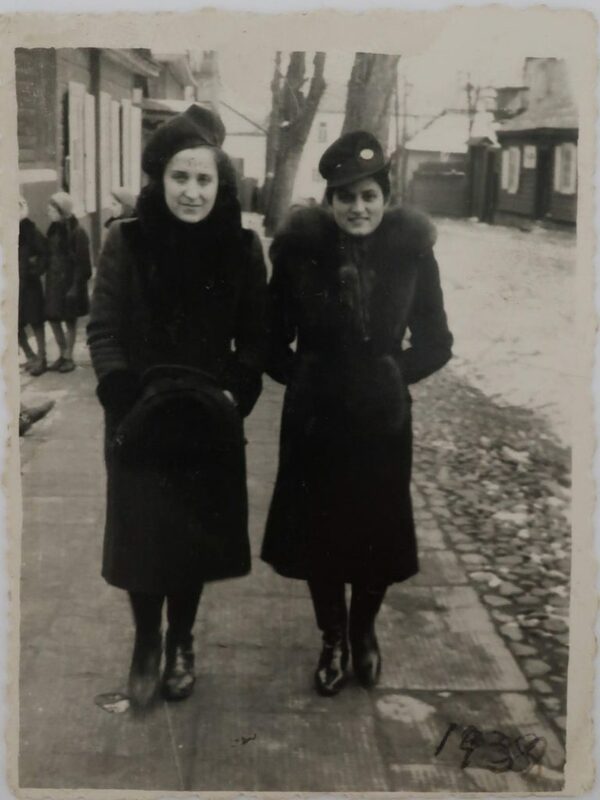 On December 31, 1939, taking advantage of the New-Year’s vacation day, Mrs. Cohn escaped to Vilna, then an independent city. Miraculously, she and a few friends and a nephew managed to cross the border after it had officially closed, and they made their way to Vilna. During her time in Vilna and environs, Devorah met her future husband, Moses J. Cohn, then a student at the Mirer Yeshiva (which had fled to Vilna) at a wedding. He offered for her to travel on his passport and with his transit visa issued by the Japanese consul Chiune Sugihara (who saved several thousand Jews through his efforts), which allowed Jews to travel to Japan as if they had a final destination of Curacao. Devorah and Moses had a fictitious state wedding in Vilna at the beginning of 1941 so that she could be legally added to his papers. Devorah and Moses travelled with the Mirrer Yeshiva via the trans-Siberian railroad to Vladivostok, and then by a boat to Japan. After several months in Kobe, Japan, a cousin of Rabbi Cohn sponsored him to come to America and she travelled with him. They sailed in June of 1941 on the Kamakura Maru, through Honolulu, Hawaii, to San Francisco, and then went by train across America. She went to New York to her brother and he went to his cousin in Boston. Rabbi and Mrs. Cohn continued to correspond by mail and in November they married and settled in Boston. Rabbi Cohn served as principal of Maimonides School for 31 years, and Mrs. Cohn was very actively involved in every major Orthodox cause in the Boston area, playing a role, together with her husband, in building up the Orthodox community there. She was particularly active in the Ladies Auxiliary of Maimonides School, doing extensive fundraising, and with the N’Shei Agudath Israel. When her youngest reached the first grade, she went back to teaching. From roughly the age of forty-five to the age of eighty, Mrs. Cohn taught at Maimonides school. She was famous as a beloved third grade teacher and later special education teacher. She would also assist all the new teachers as they came into the school, helping them develop their teaching skills. And she was in charge of decorating the halls with Jewish content. Throughout her life, Mrs. Devorah B. Cohn proudly lived and practiced the educational philosophies of her famous teacher Sarah Schenirer. See the following items on the Bais Yaakov Project website that tell Devorah’s story. With gratitude to Naftali Cohn for graciously scanning and allowing us to post these family documents. Please do not use any of these documents for commercial purposes. Educational and academic use is permitted. Please credit the family of Devorah B. Cohn, courtesy Naftali S. Cohn.